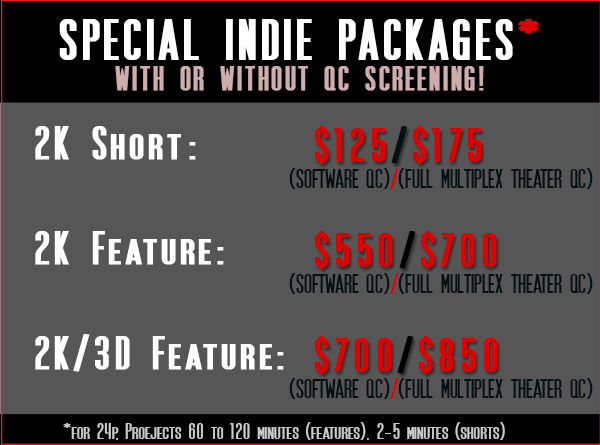 Want a big studio quality DCP at an indie friendly price and want it fast? You’ve come to the right place. SV2 DCP is by filmmakers, for filmmakers. Check out our pricing calculator, FAQ & credits from happy clients! We’ve created hundreds of DCP’s over the past 8 years that have played at Cannes, TIFF, Berlin, HotDocs, Fullframe and many more as well. Our DCP’s have played perfect on the largest IMAX® screens and other premiere venues around the world. And we also provide quality, affordable for starving indie post-production services via SV2 Studios. Visit our detailed Pricing Calculators for Features (over 45 minutes) and Shorts (under 45 minutes) for exact pricing. SV2 DCP creates professional, major studio quality Digital Cinema Packages (DCP’s) using a special in-house recipe designed to create the very best quality and fast turnaround – all at prices that indie filmmakers and producers can afford. SV2 DCP is run by filmmaker Stephen van Vuuren of SV2 Studios. DCP’s are created using the very best color, image and audio tools available in calibrated, tested controlled studio to ensure your film has never looked and sounded better. SV2 DCP does not use off-the-shelf packages that often produce sub-par results – especially the lower priced packages. Nor does SV2 DCP rely on buggy, slow free tools. SV2 DCP‘s process was developed for Stephen van Vuuren’s own project – a giant screen film for IMAX theaters created at 6k resolution for screens 8 stories high. To avoid the 5 figure prices for high end DCP’s that major post houses charge, he had to develop a low-cost process that matched them in quality. Please read more about SV2 DCP’s DCP process as well as helping you create your Digital Cinema Master (DCDM) and getting help with any other post production task including surround mixing, color correction or final mastering. "Stephen at SV2 Studios did an absolutely amazing job on the Bad To The Jones DCP! The quality of the picture on the big screen exceeded my expectations beyond belief! Seriously, he's the best and I recommend him to any and everybody needing a high quality DCP. "